Firstly I noticed that despite getting top fashion bloggers on board to develop shops, they don’t have the good grace to follow the links out to them. 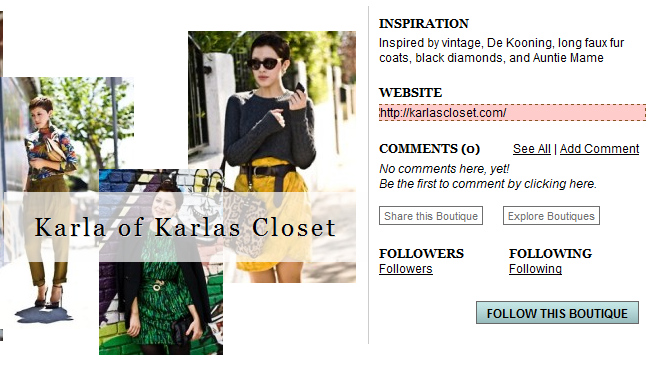 Over here with Karla of Karlas Closet shop, you’ll notice that the link to karlascloset.com is nofollow. Surely if Google have recruited someone to create a shop they must trust them? The great and the good Google can’t be hoarding page rank can they? However, whilst it’s obviously been under the hands of a good e-commerce designer, Google haven’t thought to pass it by someone at the SEO team. A friend at Clothes noticed they made a fundamental launch error and left noindex, nofollow in the robots meta tag. What effect does this have? At the time of writing there is not a single page from boutiques.com in their own index. It’s good to know that even the biggest development teams on the web can make simple errors! Clothes.org.uk have now posted Google Invites Top Celebrities to Join Boutiques.com But Won’t Let Their Own Search Engine In. You are assuming they didn’t deliberately keep the robots tags in. They did drop the ball a little bit here, but at the same time it’s nice to see they’re not abusing the `natural` search results with their own products (yet).